It was a historically bad year for the Miami Marlins offense. Over the summer, Bradley Woodrum shared with us where the team ranked in history among the weakest attacks of years past. But at that time, the team’s wRC+ was 78. The team actually finished the season with a more pitiful 72 mark, which tied the 1981 Blue Jays for lowest mark in his last graph. Unfortunately, Giancarlo Stanton was part of this offense and this fact hampered his fantasy value. But breathe a sign of relief folks, I will not be using the words “lineup protection” anywhere in this post (besides in this sentence)! While it has been argued ad nauseum that lineup protection (oops!) is a myth, it does alter the shape of a hitter’s performance and certainly affects some of that hitter’s counting stats that we care about in fantasy. The most obvious affect it has is on a hitter’s walk rate. 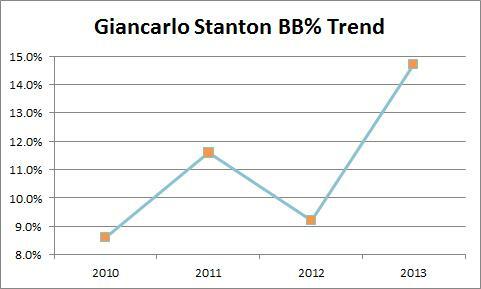 The following graph depicts what Stanton’s has done since he debuted in 2010. Over his first three seasons, he sat comfortably in the 8% to 12% range. Then this season, his BB% surged to nearly 15%. Interestingly, his intentional walk total was just five, four less than in 2012. So it would probably be correct to assume that pitchers were pitching him very carefully and issuing him more of the unintentional intentional walk. Of course, he could have simply become much more patient at the plate, which follows the walk percentage aging curve that rises consistently through age 27, before plateauing until about age 30 and then declining. Maybe it was a little bit of both. But this affects fantasy owners because it likely robbed him of opportunities to drive in runs, and given the team’s weak offense, it wasn’t all that likely that the hitters behind him would drive him home. So the weak offense hurt his runs scored total and with runners failing to get on base consistently ahead of him, reduced his RBI opportunities. Extrapolated over a full 575 at-bat season, Stanton would have driven in and scored just 84 runs. That is quite a low total for a guy who was on a pace to hit 32 home runs and bats in the middle of the order. And while the offense figures to be better in 2014, simply because it cannot get any worse and there has to be some sort of dead cat bounce, it may very well still be the worst in baseball. A full season from Christian Yelich and Logan Morrison will help, but this is still a team that features Donovan Solano/Derek Dietrich, Adeiny Hechavarria and Ed Lucas atop the depth chart at second base, shortstop and third base, respectively. There are simply too many zeroes to upgrade to move that quickly into respectable offense territory. Stanton’s power declined this year, as both his ISO and HR/FB rates fell to career lows. But his 304 foot distance that ranked 12th highest in baseball was actually higher than his 2012 mark and similar to his 2010 output. So it doesn’t appear that he really lost any power, but sustaining a mid-to-high 20% HR/FB rate is just really hard. I would figure a rebound toward his career average in the 24% to 25% range next season. In 2012, Stanton teased fantasy owners by hitting .290. Woah, not only does he have 40 home run power, but he can actually contribute positive value in batting average as well? No, that was a fluke. A career high .344 BABIP was required, but with a batted ball distribution close to the league average and too many pop-ups, it’s not going to happen again. The last thing worth mentioning is his injury history. In 2012, he underwent knee surgery that limited him to just 501 plate appearances and then this year he dealt with shoulder and hamstring issues, the latter of which landed him on the disabled list for an extended period. Once again, he was limited to just 504 plate appearances. In his first three full seasons, he has only recorded 500 at-bats once. The 40 home run power is certainly tantalizing and with fewer home runs being hit, is extremely valuable to fantasy owners. Unfortunately, Stanton has a considerable injury history, plays for a weak offense that will take a bite out of his runs scored and batted in totals and is likely to be a non-contributor in batting average at best, harmer at worst. Most fantasy owners realize this though and it’s going to make Stanton cheaper than in past years. In the one mock draft I referenced in my Carlos Gomez post yesterday, Stanton went 31st overall, which was the middle of the third round. That’s much more reasonable than where he had been going in past seasons at the end of the first or some point in the second. We hoped you liked reading Marlins Offense Hinders Giancarlo Stanton by Mike Podhorzer! 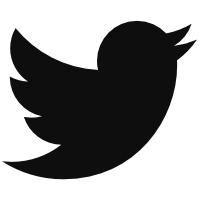 Where can these mock drafts be found at this point in time? Faketeams.com has one going on right now.